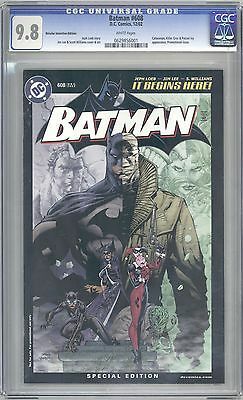 Available is an ultra rare BATMAN 608 RRP Variant Cover CGC 9.8 Near/Mint Mint. There are only 63 of these 9.8 CGC RRP variant books graded this high in the world. This is the exclusive retailer incentive variant edition and one the rarest Batman comics ever produced. It is the Limited Edition issue of Batman #608 with a Jim Lee cover distributed at an exclusive retailers only meeting held by DC Comics. Feel free to ask questions! Handling time for shipment is 24 hours from the time of purchase. Payment must be completed within 72 hours from time of buyout.